Cats instinctively know what they like and what’s good for them and you know they are getting everything they need nutritionally. Go-Cat tastes great, and now you know that when you pick up a pack, you are choosing the nation’s favourite! All Go-Cat meals now benefit from a new recipe that supports a healthy heart and which gives your cat 100% of the energy and nutrition he needs to keep up with an active life. It has all the right stuff to be good for the heart and great for vitality: the ideal amount of high quality protein and taurine, known to be good for the heart and to help keep your cat active. You can rest assured that by feeding him Go-Cat every day, you’re helping put his health first. Ingredients – Cereals Meat and Animal Derivatives (Min 25% Including Min 4% Chicken, 4% Rabbit and 4% Duck) Vegetable Protein Extracts Oils Fats and Minerals, Derivatives of Vegetable Origin, Yeast, Minerals. Go-Cat Kitten with Chicken, Carrots and Milk nuggets meets all the specific nutritional needs of the growing members of your cat family. 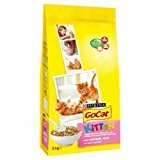 A kitten’s body is developing rapidly and with the quality protein, added calcium, milk and minerals in Go-Cat Kitten you can be sure he’s getting the very best start in life, and all the help he needs to establish a healthy bone structure, strong muscles and robust immune system. Category – Go Cat Cat and Omega Food. 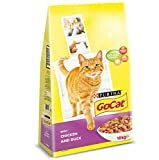 Go Cat Senior Chicken (340g) 6 Pack A combination of ingredients including chicken, rice, vegetables, vitamins and minerals make Go-Cat� for Senior Cats 7+ years a 100% complete and balanced meal. 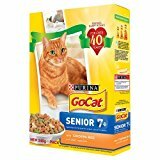 Go-Cat for Senior Cats 7+ years is all your cat needs nutritionally to help keep him healthy and happy. INGREDIENTS Cereals (white kibbles: 4% rice), Meat and animal derivatives (10%*), Vegetable protein extracts, Oils and fats, Derivatives of vegetable origin, Minerals, Yeasts, Vegetables ( 0.16% dried vegetables equivalent to 1% vegetables in the brown, green and orange kibbles). *equivalent to 20% rehydrated meat and animal derivatives, brown, green and orange kibbles: minimum 4% Chicken ANALYSIS Protein: 30.0 % Fat content: 9.0 % Crude ash: 7.0 % Crude fibres: 2.5 % FEEDING GUIDE Cat weight = amount to feed per day : Adult 3 kg = 45 g; Adult 4 kg = 60g; Adult 5 kg = 75g. The senior maintenance averages are based on moderately active cats at normal environmental temperatures. Individual needs vary and feeding should be adjusted as required to maintain your cat at a lean, healthy body weight. Fresh, clean drinking water should always be available. Sufficient consumption of water is a necessary part of healthy, every day nutrition.